Monday is here already, but where did the weekend go? Unfortunately I am completely unprepared for it and I am sadly posting late, my apologies. 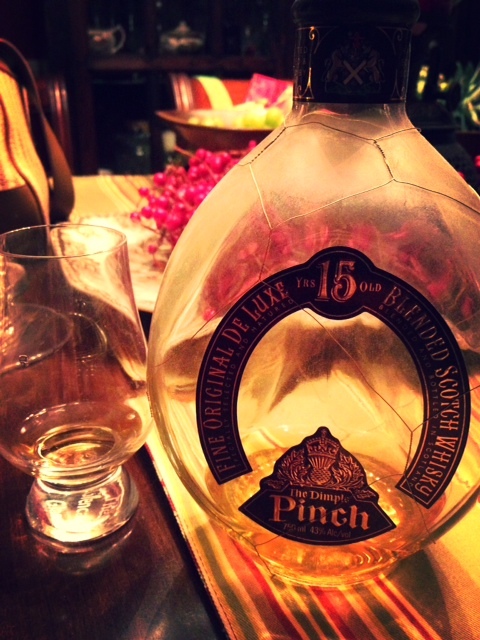 Now in a “pinch” to write my post, I found a great blended whisky to talk about and that is, Dimple Pinch 15… yes, pun intended. I am not entirely certain I would have had a chance to taste this Dimple Pinch 15 year-old had it not been in the whisky cabinet that belongs to my boyfriend’s father. To be honest, before seeing it there, I had never heard of the Dimple Pinch before. If you haven’t either then I certainly hope to change that. Dimple Pinch is a blended Scotch whisky produced by Haig. Haig or Haig & Haig is Scotland’s oldest whisky distiller which resides in the heart of Edinburgh. The company has been distilling for over 300 years which means that this is the right amount of time to perfect their products. This blended whisky contains more than 30 other whiskies in its blend. Aside from taste, what’s also unique to this whisky is its three sided dimpled shape bottle. It also has this thin wiring that is wrapped around the bottle as well. You can make it out in the picture I am posting below. It is a bottle that doesn’t go unnoticed but neither does the taste. I very much enjoyed this blend. It was complex and very enjoyable. The 30+ whiskies blend harmoniously to create a very unique smooth product. It is certainly a blend I would recommend trying if you come across it. If you are looking to purchase, depending on where you buy the price for this whisky is $35-$40. If you’ve tried Dimple Pinch before I’d love to hear your thoughts. Share those with me in the comments section.